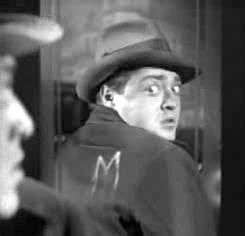 M, filmed in only six weeks, is far and away Fritz Lang’s most popular film and his own personal favourite. It tells the story of a pathological child-killer, superbly played by Peter Lorre. The story has three main phases. In the first phase the situation of conflict is established. There has been a series of gruesome child murders that have gripped the city (said to be a city of four million people, suggesting Berlin, but the real events that inspired this story took place in Düsseldorf). The police are combing the city for everything they can to find on the killer, but there are no clues. As the frustrated police increase the intensity of their search, they continually raid all the houses of prostitution and known gambling parlours, interfering with “business as usual” for the criminal underworld. In phase 2, the criminal underworld decides that they, themselves, must capture the killer in order to get the police off their backs. This stage of the film tracks the parallel activities of the two groups, the police and the criminal underworld, as they work separately to hunt down the killer. Most people find this clever back-and-forth switching between parallel scenes showing the two contrasting groups working towards the same goal to be the most intriguing and satisfying aspect of the film. In the third phase, the killer is cornered and eventually captured by the criminal underworld. They proceed to hold a mock trial, which seems to have about the same degree of "fair hearing" court procedures as those conducted by the government authorities. It is here that the killer, played well by Lorre, finally breaks down in a dramatic confession of his guilt. The killer, Hans Beckert, is presented in the film with a certain amount of sympathy for the way in which he is the helpless victim of his own pathology. Because of Lang’s sensitive treatment of the killer, his characteristic fatalistic development of events gains a rare tragic intensity. This brings out a difference between Alfred Hitchcock and Lang. Hitchcock’s dramatic tension emphasises the suspense, while Lang’s emphasises the fatality of character. Lorre, as the culprit, squirms in a relentlessly encircling web. The killer, tracked down and caught like a dangerous animal, is presented as unable to check his sick urges. After each of his crimes he remembers nothing of the details and his urges. His attitude is one of utter disbelief and sorrow. With M, Lang gives a new dimension to the “dual personality” theme which has so often fascinated the German mind. Stylistically, M is especially significant in several respects. It marks a transition for Lang as a director. Although he still uses people and objects expressionistically, he has opted, on the whole, for a more realistic depiction of character and events. 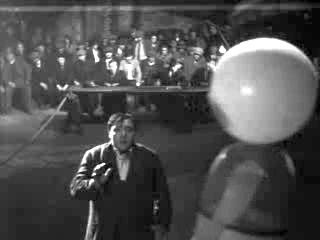 Cardboard characters, monumental sets, and the grouping and movement of crowds no longer have such a complete monopoly on Lang’s attention as they did in Metropolis. Also M was Lang’s first sound film. He immediately incorporated sound not only as an additive feature but as a separate, independent element. Long before the audience gets a first view of the main character, they hear him talking to a young girl or whistling a melody from Grieg’ (Peer Gynt Suite, Hall of the Mountain King”,) which remains his “leitmotiv” throughout the movie. Sound is also often used to tie up different elements; while the sound of one scene lingers, the camera moves through a sequence of different, but related takes. Possessed of a quickness in learning technique, Lang became a master of the use of sound in his first attempt. Throughout the film, there is an interesting subtext conveyed by presenting the parallel activities of the police and the underworld. Both forces are led by charismatic leaders: Inspector Karl Lohmann for the police and the ruthless Schränker (himself wanted for three murders) for the underworld. Because both forces are highly organised and are undertaking the hunt in parallel, many viewers think that Lang is representing the two forces as essentially and morally equivalent. But I don’t hold to that opinion. The two forces actually represent two competing and contrasting world views, and this may have represented a commentary about contemporary German society. Throughout the film the police attempt to use science and technology in order to hunt down the killer, Beckert. They represent the Western rationalist view, including the notion that a psychotic criminal is, himself, the victim of some forces outside of his control and needs medical care, rather than punishment. On the other side, Schränker and the underworld use more traditional social operations to track down the killer. For example, they organise all the beggars in the city to follow every single school child as they walk home from school. They can be seen to represent more traditional forces of social control that are closer to mob rule than the rule-driven mechanisms of the police. This mode of operation can sometimes be more efficient in the eradication of evil-doers, but is it desirable? Their leader, Schränker, is simply the most ruthless and cunning among them, even resorting to torture; whereas Police Inspector Lohmann is more cerebral and reliant on rational procedures of evidence gathering. In the end Lohmann succeeds in locating the whereabouts of the mock trial and just barely halting what would have been a gangland-style execution. Justice has prevailed. Even today, though, viewers are likely to be divided on what really should be the ultimate fate of Beckert.